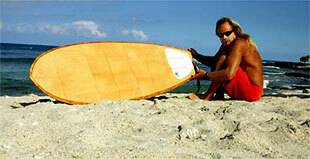 Bamboo surfboards - How tough is bamboo plywood? After over 10 years of bamboo board making, I would estimate that each layer of rotary bamboo veneer is roughly as strong as one layer of 4 ounce unidirectional fiberglass. Two layers of bamboo veneer with grains crossed (Eco-Logic 3.2 mm bamboo plywood has 7 layers of crossed grain bamboo veneer), epoxy laminated and vacuum bagged uses less resin than a hand laid-up 8 oz. fiberglass. These are truly “green” boards – the sanding dust is not itchy, the foam dust is recyclable, and the renewable bamboo fiber trimmings decompose into soil. 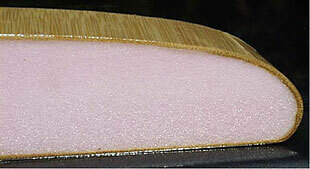 Epoxy has very few volatile fumes, is stronger and is used more efficiently than polyester resin in regular boards. Very little epoxy winds up on the floor and very little acetone is used in cleanup. Polyester resin does NOT bond well to bamboo plywood. Pre-laminated bamboo panels have water absorbing problems too, often due to funky, non-waterproof glues and voids (Eco-Logic bamboo plywood panels use water friendly glues). With Gary’s years of experience, we think that the take-out for enterprising local surfboard shapers & manufacturers is that bamboo plywood is strong and able to handle the hammering a surf board takes. But there seems to be one caveat to consider from his experiences: if you are using pre-pressed multi-layer boards (such as the Eco-Logic 3.2 mm multi-layer bamboo plywood panels), you need to ensure you order bamboo plywood panels specifying “water compatible” glues. The Eco-Logic Bamboo 3.2 mm bamboo plywood panels are manufactured with water compatible glue, so no worries there. Durability is often overlooked as an aspect of a green product. While it is true that rocks will always be stronger than a reasonable weight board, I pride myself in the lack of deck dents in a bamboo NFC surfboard – common with a comparable weight fiberglass board. Here is a snap of Ceviche Dave – look ma, no dents! So if you do get a ding, it is ok to keep surfing but it is best to fix it properly as soon as possible if you want to minimize discoloration of the bamboo and prolong the life of your bamboo board…. We hope you are inspired into action – bamboo is a real and viable green alternative for the surfboard industry. Not only that, it’s healthier for the guys & gals building the boards. Here’s a video of someone surfing a Gary Young bamboo surfboard … enjoy!